Cam Newton greets Drew Brees after a game in Charlotte, N.C., Sunday, Sept. 16, 2012. FiveThirtyEight is running a series of eight NFL previews, one division at a time, to highlight the numbers that may influence each team’s season. America’s favorite weekly soap opera is about to begin; get prepped. The excellence of the Saints’ offense is established. Quarterback Drew Brees has ranked No. 1 in passing yards over the past three NFL seasons, and his 2013 totals — 5,162 yards and 39 touchdowns — were only surpassed by Peyton Manning’s record-breaking numbers. Jimmy Graham is an exceptional tight end (and a good if not great receiver). But on the other side of the ball, Rob Ryan’s defense needs to continue to deny the advances of opposing teams — and to secure more takeaways from them. Ryan unquestionably made an impact last season, his first in New Orleans. In 2012, the Saints had allowed the most single-season yards by a team in league history, and ranked last in Football Outsiders’ defense-adjusted value over average (DVOA) metric. After Ryan signed on as defensive coordinator a year ago, they pulled up to 10th in defensive DVOA. But the Plexiglas Principle — that teams who make significant improvements in a given category from one year to the next tend to regress back toward their previous form — might hit New Orleans’s defense hard this year. Perhaps there’s still reason for optimism about the defense, however. Last year, the Saints were a top-10 defense, despite securing the league’s fourth-fewest turnovers per game. Turnovers are one of the most volatile statistics in football, and the Saints could benefit from a bit more luck this year. That would help offset any regression in the other aspects of their defensive performance. Carolina Panthers head coach “Riverboat” Ron Rivera was known as a gambler last season, and much of the team’s 12-4 record was attributed to his aggressive choices to go for it on fourth down. But in the offseason, he and Carolina general manager Dave Gettleman appeared to make another bold move, jettisoning the team’s best wide receiver, longtime Panther2 Steve Smith. That was especially risky given that they lost their three other top wideouts (Brandon LaFell, Ted Ginn and Domenik Hixon — all of whom signed as free agents elsewhere) and Pro Bowl left tackle Jordan Gross (who retired after the season). That means it’s up to three new acquisitions — veteran third-wideout types Jason Avant and Jerricho Cotchery, and rookie Kelvin Benjamin — to catch quarterback Cam Newton’s passes, and it’s on the unproven Byron Bell to protect his blind side. Newton’s new supporting cast has raised its share of questions over the offseason. But the receivers who left weren’t that great, either. Newton3 wasn’t particularly efficient (on a per-play basis) a year ago, even with his old teammates in the lineup. After a solid 2012 season in which he ranked 15th among qualified quarterbacks4 in combined passing and rushing DVOA, the former Auburn standout fell to 20th in 2013. Newton may have set career highs in wins as a starter (12), passing touchdowns (24) and completion percentage (61.7 percent), but the underlying advanced metrics weren’t kind. Newton directed 53 percent of his pass attempts to the now-departed Ginn, Smith and LaFell in 2013, and on those plays he averaged an unimpressive passing DVOA of -3.5 percent last year (slightly ahead of the Tennessee Titans’ blah QB, Ryan Fitzpatrick). When targeting tight end Greg Olsen, though, that number rose to +3.8 percent (more like a cross between Andrew Luck and Carson Palmer — quite a difference). Olsen is back for 2014, and it’s not hard to envision Cotchery,5 Avant and the rookie first-rounder Benjamin combining to cover the DVOA necessary to break even on Carolina’s receiving-corps overhaul. And if not? Hey, Newton can always run the ball. For a team that’s won two division titles since 2010, and in 2012 came within yards of a Super Bowl berth, the Falcons had a surprising down year last season. In part, blame injuries. The offensive line was decimated; wideout Julio Jones, leading the league in receptions at the time, was lost to a fractured foot during Week 5; all-time Falcons receiving leader Roddy White coped with a high-ankle sprain; and the usually dynamic running back Steven Jackson had hamstring problems. With his supporting cast on the bench, quarterback Matt Ryan unraveled, throwing 17 interceptions and suffering through an eye-popping 44 sacks — both career highs. 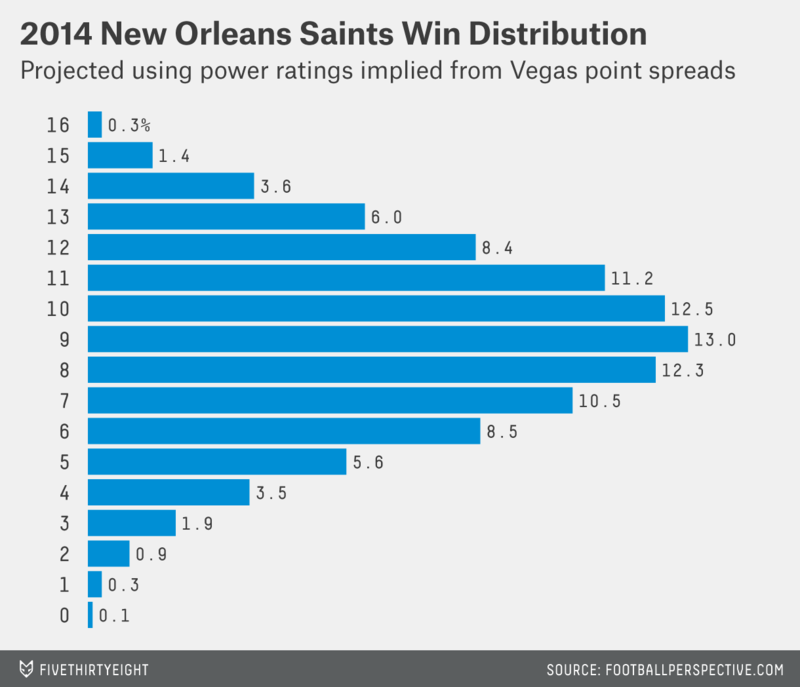 But Atlanta fans can almost certainly bet on a better showing than last year’s dismal record. Even with Tony Gonzalez’s departure (the 37-year-old tight end pulled in 83 catches, 859 yards and eight touchdowns in his final NFL campaign), Atlanta has a couple of statistical factors working in its favor going into the 2014 season. First, there’s our old friend the Plexiglas Principle (see the Saints section above). Historically,6 teams that decline by more than seven wins in a given year tend to improve their record by 4.4 wins the following season. 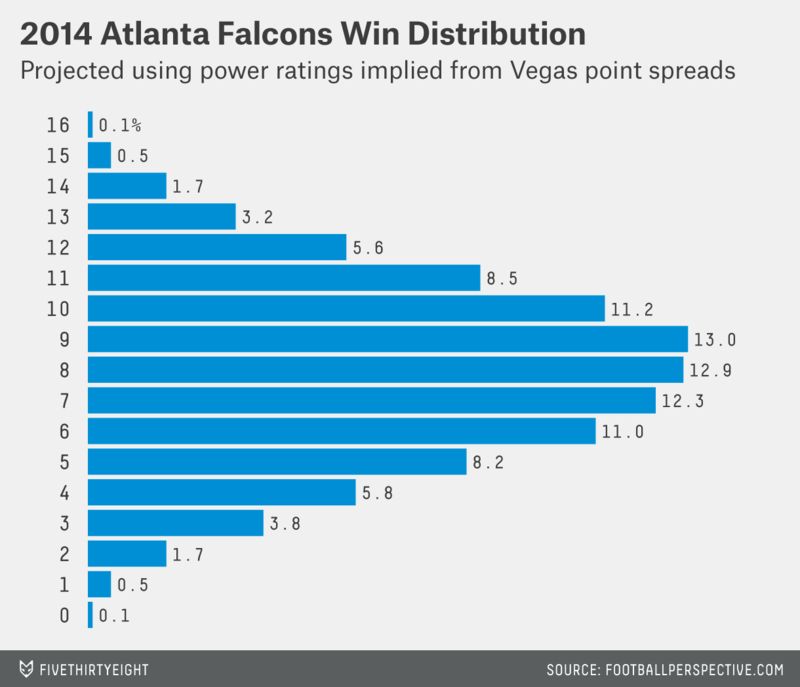 Last year, Atlanta’s win total declined by nine, making an improvement that much more likely. Also, consider how the Falcons lost last year — seven of the team’s 12 losses came by a touchdown or less. Agonizing close losses and a tough slate of opponents meant Atlanta performed more like a six- or seven-win team in 2013, according to its schedule-adjusted Pythagorean rating. As our colleague Bill Barnwell at Grantland has explained, teams that underperform their Pythagorean expectation by that substantial a margin can expect to improve more than a little bit the next season. That’s partly why Vegas’s preseason over/under win totals have Atlanta winning 8.5 games (tying the team with the division-rival Carolina Panthers). Don’t be surprised if the 2014 Falcons look a lot more like the Falcons that went 56-24 in head coach Mike Smith’s first five seasons than the team that went 4-12 last year. The Tampa Bay Buccaneers have a new head coach, Lovie Smith, who spent last season watching football from his basement after being fired by the Chicago Bears in 2012. The Bucs had a dreadful 2013 season — can their former linebackers coach better steer the ship? This all bodes well for the Buccaneers, whose defense is starting from a reasonably strong place. The unit ranked a respectable 14th8 in DVOA over the past two seasons, and that was with defensive players generating 45.7 percent of the team’s AV. That number is less than the average Bears team during Smith’s tenure, but when we look at how the defensive value was distributed among positions, an interesting pattern emerges: Both the Bears of Smith’s tenure in Chicago and the past two Tampa Bay defenses gained about the same proportion of their value from the defensive line (Bears 37.4 percent, Buccaneers 38.2 percent), linebackers (Bears 29.4 percent, Buccaneers 27.3 percent) and the secondary (Bears 33.1 percent, Buccaneers 34.4 percent). Smith and new defensive coordinator Leslie Frazier will at least have a template that they’re comfortable working with. To that end, the Bucs returned their top defender (as rated by AV) from 2013, Gerald McCoy, and added free agent pass-rusher Michael Johnson from the Cincinnati Bengals, a double-digit sacker a year ago. The secondary has taken a hit with the release of cornerback Darrelle Revis (now in New England) to free up salary cap space, so the Bucs will be looking for a strong performance from former Tennessee Titans Pro Bowler Alterraun Verner, or perhaps even former No. 7 overall draft pick Mark Barron (who has not met expectations yet). 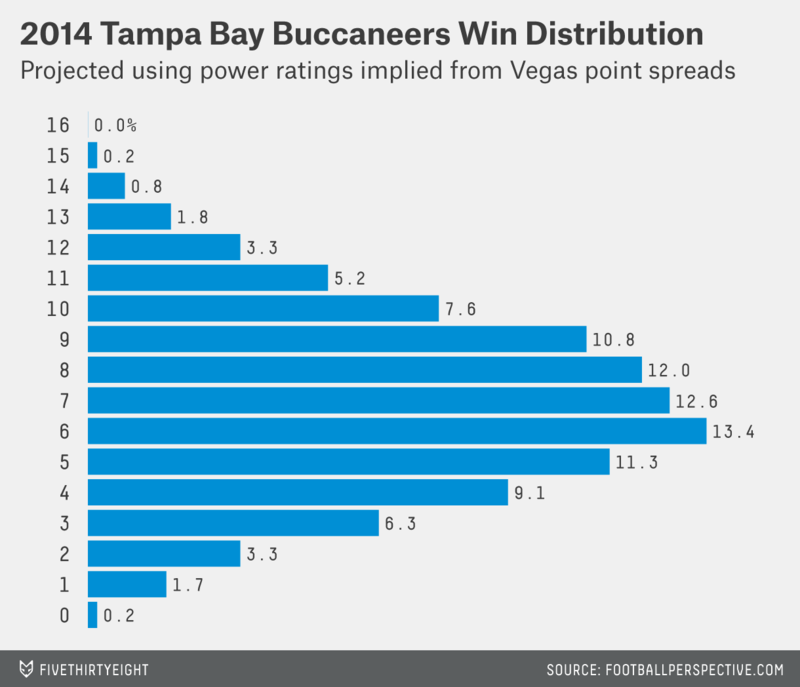 Of course, a team needs to score points to win, and Tampa’s offense was dreadful last season. It ranked 24th in the NFL in efficiency (Smith’s offense in Chicago never finished higher than 20th in the league). Although it’s unlikely the Bucs will make great offensive strides this season, Smith has done plenty of housekeeping in an effort to climb the ladder — including bringing in former Bears QB Josh McCown, who was insanely efficient in limited action a year ago. 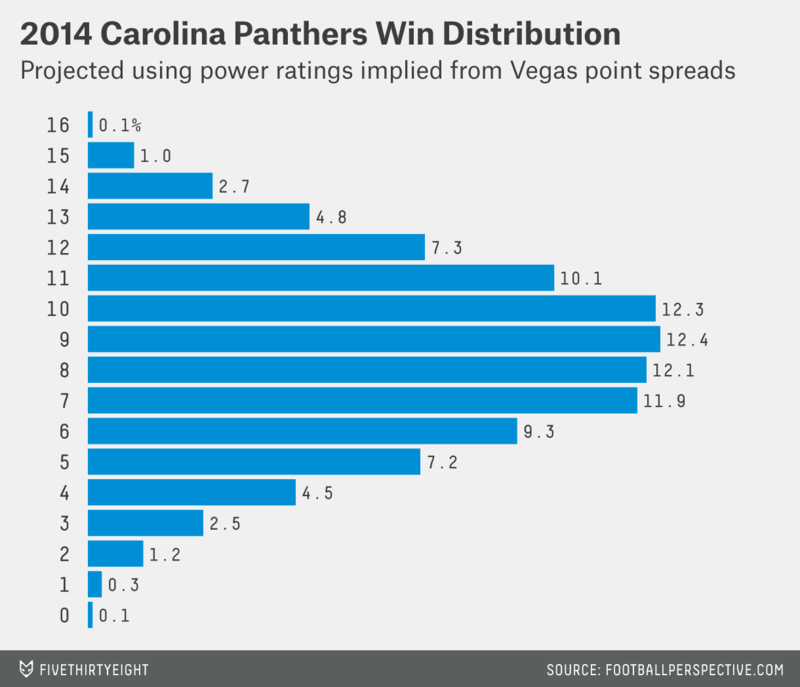 Read more of FiveThirtyEight’s NFL season previews. CORRECTION (Sept. 2, 9:12 a.m.): A previous version of this article said the New Orleans Saints have a 30 percent chance to win the NFC South. They have a 35 percent chance. On the whole, the South should be improved compared to its collective record last season. Those with at least 180 combined passing and rushing plays. Going back to the 1970 AFL-NFL merger and pro-rating all schedules to 16 games (when necessary). Approximate Value is Pro-Football-Reference.com’s attempt to generate a single numerical value representing the quality of any player’s season, regardless of position. Averaging the Buccaneers’ DVOA from 2012 and 2013, when they placed eighth and 20th, respectively.